Wow, I left this late. But now I got the chance to use last week to see how things pan out, we can now move on to other cards. It's BT14 Box Topper Promo Week, and starting us off is Sanctuary of Light, Brightness Dragon. I can't review the second skill given it's freaking useless against anything not Link Joker, so let's look at what you really want it for. This thing, in Late Game, lets you Counterblast 2 and Soulblast 2 to pick three Royal Paladin rear-guards, and give them 5k until end of turn. It's...something? I don't see a lot of point to this other than within his own build, with Planetal Dragon. There's a lot of things that give power to rear-guards Late Game so I've desensitized myself regarding their use. They're not that explosive and the fact you have to wait only makes it worse. I don't really like it. Get it for the collection but there's honestly better RPs to choose from. It's Unlocking week. This week we're looking at cards that all have the ability to unlock a unit on your field. Most require a Counter Blast of 1 to do so. ...Except that it never, ever makes the mechanic, card or deck useless, because, if anything, most of those counters are completely useless. Anyway, onto the card itself. So, what do we have here then? Hmm, CB2 and SB2 to give 3 rear-gaurd units +5000 power until end of turn? And it's a Royal Paladin? Sounds a lot like Soul Saver Dragon from set 2. And I do love me some Holy Charging Roar, that's for sure. This is a very nice replacement for Soul Saver Dragon for Royal Paladins, only downside is that it doesn't get +3000 when attacking, but, hey, at least you don't need your rear guards filled up before you use the effect, letting you set up an optimum field for a pressing attack, plus, you can do it more than once a game, though it would require some soul charging. And, remember, Royal Paladins excel at two things: Searching and powering up. 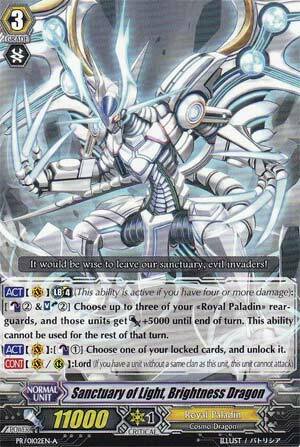 It's not as good as Majesty Lord Blaster, and Ashlei Reverse might be a little bit better, but considering Ashlei only works with Jewel Knights and Brightness Dragon works with all Royal Paladins, well, I do love some general support cards. Sadly, unlike Soul Saver Dragon, this can't work with Majesty Lord Blaster. Though, why you'd run both in the same deck, I dunno. If not for the Lord effect and the fact that Majesty Lord Blaster exists, this would be a must-have for all Royal Paladin decks. In fact, if you're running Royal Paladins and aren't running Lord Blaster or Jewel Knights, this is a must-have for your deck.